Huawei Honor works in 2G/3G networks, downloading and uploading data at up to 14 Mbps and 6 Mbps, respectively. As mentioned in the specifications, the smartphone supports Wi-Fi 802.11b/g/n and Bluetooth 2.1. The latter isn't of the latest version but does everything necessary: transfers files and outputs stereo audio according to A2DP. Huawei Honor can also tether its Wi-Fi connection to nearby devices. Like any other Qualcomm-based smartphone, the Honor has a built-in GPS receiver with A-GPS support. There are no special navigation apps bundled, just the usual Google Maps with navigation. Compared with other smartphones, Huawei Honor has a very capacious Li-Ion battery: 1930 mAh vs. 1650 mAh of Samsung Galaxy S 2, 1530 mAh of HTC Sensation, for example. As shown by our tests, the battery has enough juice for 14 hours in the 'ebook' mode at 75% brightness, almost 37 hours of music playback with the screen turned off, 10 hours at the maximum load: 100% brightness, all wireless interfaces enabled, with a movie streaming over Wi-Fi. As you can see, thanks to the capacious battery, Huawei Honor works under the maximum load for as long as most other smartphones work under typical load. All in all, this smartphone is one of the battery life champions, according to our tests. With just phone calls and 3G and Wi-Fi connectivity, its battery lasts for about two days. As mentioned in the specifications, the Qualcomm MSM8255T system-on-chip (same as in the HTC Titan, for example) features the Scorpion 1.4 GHz CPU and the Adreno 205 graphics core. Huawei Honor also has 512MB RAM. 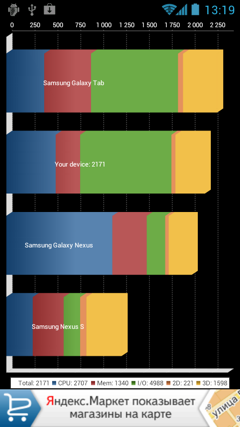 Below are the test results of today's smartphone compared with other similar devices we had tested. The tests were conducted with Benchmark 1.03. Thanks to the high CPU clock rate, Huawei Honor won in many benchmarks, having even bested such flagship devices as Samsung Galaxy S2 and HTC Sensation. In the Quadrant Standard benchmark, the Honor scored 2171 points, a nice result for a mid-range device. Unfortunately, you can see that while the CPU is very fast, the graphics core isn't. The Qualcomm MSM8255T platform is disbalanced in this respect. Anyway, from the user's point of view, everything works smoothly, without lag. The smartphone can play 720ð videos (MP4, 4.5 Mbps, AVC/AAC) without noticeable lag. In turn, 1080ð videos (MP4, 7 Mbps, AVC/AAC) stutter noticeably. For this test, we used MX Video Player in the software decoding mode. Compared with the junior Huawei Vision, the Honor is better in every aspect. These smartphones used to belong to different price ranges, but now that they should both cost $300-something, going with the Honor is more justified. Smartphone's downsides include the display which is inferior to AMOLED and S-LCD, mediocre camera image quality, and probably design which may seem too generic. The upsides (which outnumber the downsides) include the very long battery life (one of the longest), high performance, large display, upgradability to Android 4.0, and, of course, the price. If we forget about brands and vendors for a second, the Honor is a quality workhorse with an adequate price and matching features. For many people, this is just right.